Westlife's Nicky Byrne and his wife Georgina Byrne leave Holles Street Maternaty Hospital in a black Range Rover after they had twin boys recently and named them Rocco and Jay. As the babies were born premature they will remain at the hospital until they reach the a healthy weight, Dublin, Ireland - 26.04.07.
awww c'est trop mimi ! J'adoooore les enfants ! Nicky est trop chou avec les peluches dans ses mains ! Sutout les filles le jour où Westlife vient en France pour une date concert prevenez moi ! Je veux y aller. L'espoir fait vivre...hein Annie ? IF Grandad can do it, then so can we. Rocco Bertie Byrne and Jay Nick Byrne were photographed by the media for the first time yesterday and slept soundly throughout. Their grandfather, the Taoiseach, was somewhat more energetic. But then he had earlier claimed he slept soundly through much of his own big day, Friday's election count, so this could explain his fresh appearance. "I know I'm an unusual guy in a number of ways but in fact the first report I had got on the entire election was when my daughter Cecelia contacted me at 5.40 in the afternoon to tell me things were going well," he chuckled. "I had no contact with the outside world until then." So - let us get this straight - on the day of the most-anticipated election count in decades, the leader of Fianna Fail had no idea how destiny was panning out for his soldiers until tea time? "None whatsoever." And all because you didn't get out of the scratcher? "I was in bed, I slept until about twenty past four in the afternoon." Some of Manchester businessman Michael Wall's money must have been spent on a decent mattress. 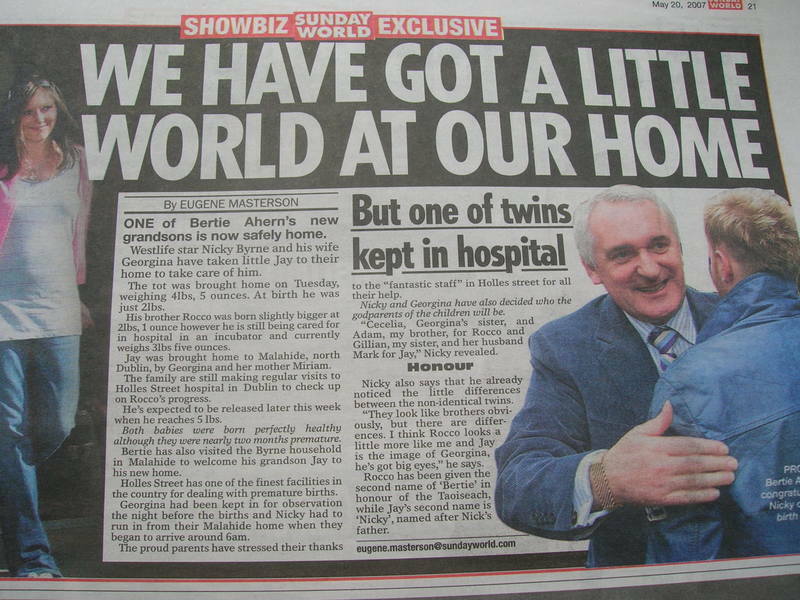 Taking into consideration that Bertie revealed last week that he had been surviving on four hours' sleep a night for five weeks, his claim of an epic shuteye is a little easier to swallow. It is still hard, though, to shake the image of him sitting on the couch in Drumcondra, mobile phone off, glued to the screen and nodding to himself as his greatest victory unfolds. Now we know that Bertie was so laid back about it all, he was horizontal. "I think the next person I spoke to was [Fianna Fail press director] Mandy [Johnston] about an hour later so I didn't watch any tv or radio until the nine o'clock news." Come to think of it, he didn't miss much. Nor did his granddad kids yesterday. The cute pair, in baby blue and white woolly hats, were held by parents Nicky and Georgina as photographers filed into a small room in the Malahide Grand Hotel in north Dublin for a quick shot. Little Rocco made his first trip home last Sunday; his brother had beaten him to it by a couple of days. They had been cared for at the Maternity Hospital in Holles Street since their birth there - six weeks premature - on April 20. Neither boy was answering questions yesterday. Nor, indeed, was their grandfather who, admittedly, looked well-rested. Billed as a photocall, journalists hoping for a quick word, a quick look or even offering to change a nappy were left to sulk in the corner. Earlier, Bertie had said that there was no problem with the media despite throwing the toys out of the pram on Friday night. "I'm not in any way angry and 98pc of media I don't have a problem with ever..." he told RTE radio. "I'm not a bitter person, I don't hold grudges, I don't go around saying 'so and so, so and so said that, I have to get him back'. "I'm not interested in that, it's not Bertie Ahern, the campaign is over and other than being fairly wrecked, tired like every other politician I'm not at all angry at the media or anybody else." Most likely then he was just a little tetchy on Friday night - despite the big sleep - when he took a swipe at journalists, their salaries, their expense accounts and the reasons behind the questions they asked. It's all a little childish. Yesterday was just about the boys, really. Mr Ahern revealed that they had been in to see him last week at campaign headquarters, and if, in 20 years, they asked what he was most proud of, he had the answer ready. "The answer for that is easy for me, I have had 30 years in politics, 40 years almost since I left school ... it is to move from the horrors of Northern Ireland that I went to school with, spent my teenage years with, spent my 20s playing football with, spent my political years with - to see that solved, nothing I will do can ever beat that," he said. Bertie Ahern is a man who has fought some extraordinary battles, and is now on the brink of leading his party back into power for the third time in succession. 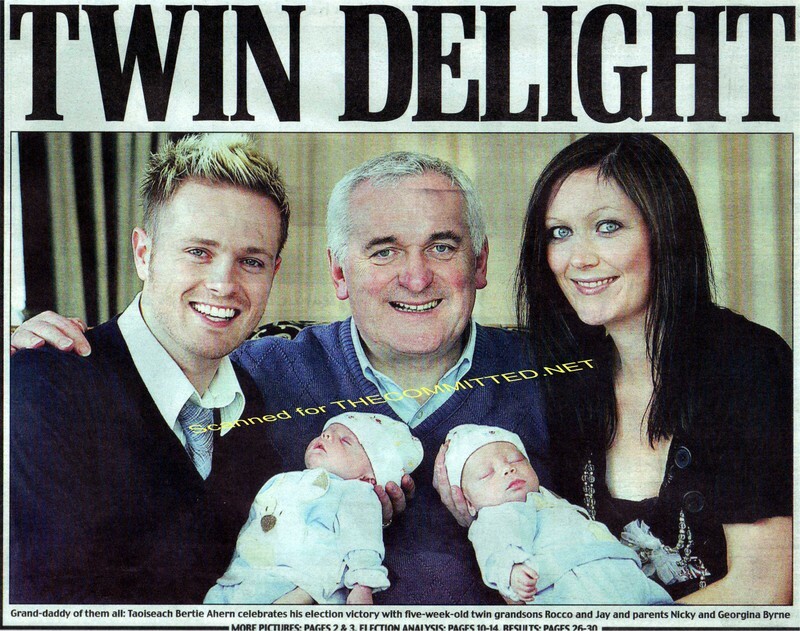 This time, he will be heading back to the Dail as a granddad. And given that he has just faced down the mother of all election battles, it's probably no wonder Bertie can, for the moment at least, sleep easy. He knows he still holds all the cards when he returns to the table later this week. Je suis également une grande fan de Westlife, c'est d'ailleurs grâce à Ronan que je les ai connus. Comme vous l'a dis Sylvie, il existe un site WestlifeFrance depuis un an ! Voici une bonne nouvelle pour les fans de Brian McFadden ! WestlifeFrance annonce l'ouverture très prochainement du site Brian McFadden France !!! Celui-ci fera partie du site WestlifeFrance. Des nouvelles toutes fraîches très bientôt.